I can put my finger on the exact moment where Thanksgiving related food stopped being appealing: Friends Ken and Carrie invited us over for dinner and a game of cards, and I gave in to uncouth temptation and drank a tablespoon of the Asian dipping sauce that accompanied the pot stickers. And still, my salt/sharp craving was not sated. So this is what I made when I went over to Sara’s apartment to see and indeed to watch her brand new Black Friday sales flat screen television. We settled in with noodles and Netflix as Poirot solved mysteries in 34 inch HD. “Who says things can’t make you happy?” said Sara. Quite a shot in the arm for Capitalism in a month where it’s been about as popular as a hedgehog in a balloon factory. This entry was posted in The Monday Treat and tagged Black Friday sales, bok choi, coriander, fish sauce, ginger, mint, salmon, soy, Thanksgiving. Bookmark the permalink. I finally got around to making this for supper, last night, and it was a hit. My wife asked me to make it again next week, and I think my 15-year-old actually ate some of the Bok Choi. I used Steelhead Trout, and added a couple tablespoons of wine to the sauce. Delicious! 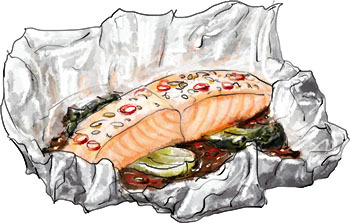 I’m really glad you enjoyed the recipe – using trout is a great idea – such a delicious fish. I am very proud that a teenager ate a vegetable indirectly because of me. Thanks for stopping by and letting me know how it went!